Andrew McCabe was fired hours before he would’ve collected a multi-million pension from FBI, where he served as deputy director. It was abundantly clear that Mr. McCabe had to go—and this wasn’t from the Trump White House. Sure, President Trump made McCabe to be a boogeyman, but the smoking gun was not in the Oval Office, it was the FBI’s own Office of Professional Responsibility, which recommended McCabe get the axe. The reason: lying to investigators and an unauthorized media disclosure to The Wall Street Journal about the tension between the FBI and DOJ over the Clinton Foundation probe. Oh, and it wasn’t just one time. As Guy wrote yesterday, citing the Washington Post, OPR cited McCabe with four times to lying to investigator, including former FBI Director James Comey. McCabe’s wife, Dr. Jill McCabe, ran for a Virginia State Senate seat in 2015. The political action committee for then-Virginia Governor McAuliffe, a Democrat and Clinton ally, donated $467,500 to her campaign, while the Virginia Democratic party gave $207,788, The Journal reported. Andrew McCabe was associate deputy director of the FBI at the time. E-mail communications recently released by the FBI in response to a Freedom of Information Act (FOIA) request show that Deputy Director Andrew McCabe may have violated the Hatch Act and corresponding Department regulations prohibiting political activity during his wife’s 2015 campaign for the Virginia Senate. Yeah, that doesn’t sound like separation or going “beyond what the rules required.” I’m sure all of these questions will be asked and answered when McCabe is brought before Congress for more testimony. Mr. McCabe is also likely to file suit over his dismissal from the FBI. These things will take money, and he’s been flooded with over $500,000 for his legal fund. Will Trump/Russia be included in the debate as to why McCabe was fired, and that of the overall tension the FBI has with the Trump White House? Most definitely—but the OPR report is quite clear that McCabe was fired because he leaked sensitive information, like Comey, and lied about it multiple times. 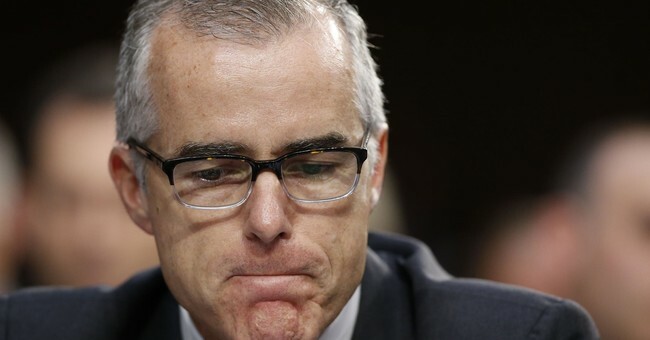 The fact that both men leaked information adds to the sad state of affairs the FBI has found itself, but it seems McCabe’s own actions were the reason for his rightful dismissal. Moreover, he obviously had selective hearing concerning building those walls of separation regarding his wife’s campaign. He’s not being scapegoated. The Obama-appointed IG isn’t singling him out either. He lied. And now he’s paying the price, though many are viewing him as some political martyr. He isn’t nay of those things. And this glaring falsehood in his wife’s op-ed, only adds that this family is taking a page out of the Clinton political playbook concerning scandal.